For many, hair loss is just another symbol of growing older. As hairlines recede, considerations for remedies commence. Hair transplants can be expensive, invasive and are not to everyone’s taste. And while toupees and comb overs offer comfort to some, others are not satisfied with these options. Until recently, these have been the primary choices when confronted with hair loss. “Micropigmentation gives clients another option to help them with their hair loss concerns,” says Tino Barbone from the Scalp Micropigmentation Center in Toronto, Canada. “For men and women that have thinning hair and don’t want a hair transplant or who cannot afford a hair transplant, we can now cover the scalp with thousands of simulated hair follicles to give them the look of a fuller, thicker, denser head of hair,” says Barbone. Micropigmentation is a procedure where a professional repeatedly inserts a single needle the size of a hair follicle into the shallow layer of the scalp. Injecting grey or black pigments into the scalp simulates the hair follicle of a freshly shaved head. “It looks so realistic that no one will be able to tell the difference,” says Barbone. Micropigmentation fills in hairless areas or bolsters thinning locations on the scalp and also helps camouflage head scarring. 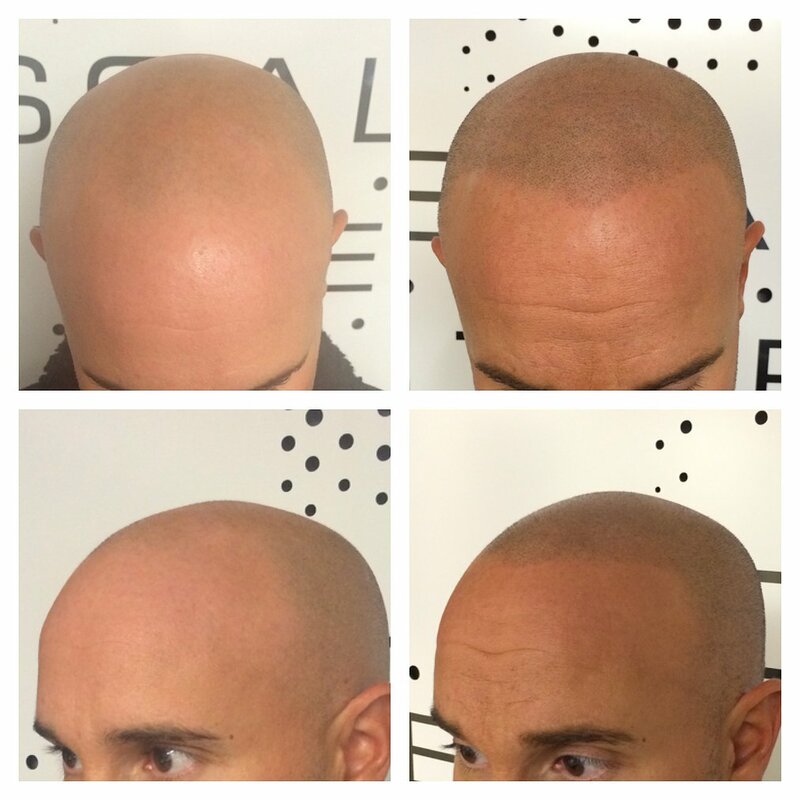 Before and after scalp micropigmentation. Credits: Scalp Aesthetics. Micropigmentation may share certain characteristics with traditional tattooing but the two should not be confused. In both procedures, a needle injects pigment in the skin to create a mark, but that’s where the similarities end. Micropigmentation and traditional forms of tattooing differ in almost every other procedural aspect. “We don’t want the simulated hair follicle to grow any bigger, morph or migrate,” says Barbone. While traditional tattoos stretch and fade over time as the skin changes, micropigmentation would lose its realistic effect if it did the same. In part, the transient nature of micropigmentation is a result of another difference between it and traditional tattooing: pigment placement within the skin. Traditional tattooing can place pigments at two millimeters beneath the outer layer of skin. Another important distinction between tattooing and micropigmentation is the type of ink used. “Our ink is strictly organic charcoal, unlike that used for tattooing which has derivatives like metallics and dyes,” states Scalp Aesthetics’ Eric Taylor. The nature of the procedure also allows for quicker recovery than traditional tattooing. While tattoos take a minimum of two weeks to heal, with severe scabbing occurring during this period, the micropigmentation process takes mere days. The only special care required is to avoid getting the head wet for a minimum of 24 hours. Removing a traditional tattoo is a costly, time-consuming process. Depending on the location and colors used, tattoo removal can take between three and ten sessions for laser removal with a recommended six weeks between treatments. This means that removing a tattoo can take between four and fourteen months, while complications can lead to scarring. The procedure used to be a last resort for people with hair loss, but now many see it as an alternative to traditional methods of dealing with the problem. “Micropigmentation has become more popular and less taboo. Today it’s in the conversation at hair transplant clinics, salons, medspas, along with hair loss shows and conventions,” notes Barbone. Taylor is a strong advocate for micropigmentation. After having the procedure done on his own scalp, he was convinced that he needed to preach the virtues of micropigmentation to rest of the world. “I left my profession as a business development manager at a national marketing agency two weeks after having the procedure done and have never looked back,” remarks Taylor.